After a good Scottish breakfast, we packed a picnic basket and headed for St. Andrews. The ride took us past sunny fields and flowering meadows. We crossed the River Earn and saw the Forth of Tay in the distance. Having arrived St. Andrews, we decided to park near the beach where there was free parking. The parking areas were already full and so we parked in a small alley very close by. We left our picnic basket in the car and went to the cathedral of St. Andrews. 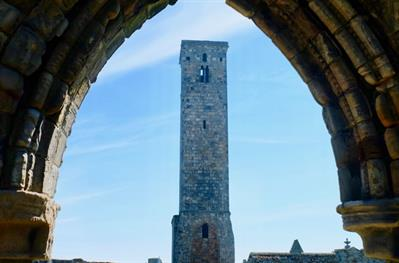 The 100 steps of the very narrow spiral staircase leading to the top of St. Rule's Tower were exhausting but we were rewarded with a great view over the city and the sea. 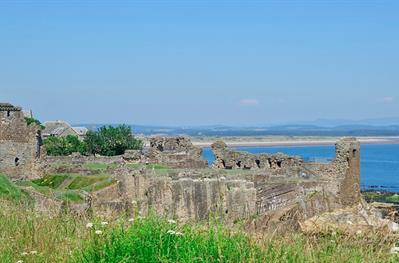 Then we walked to St. Andrews Castle, which is right on the coast with a great view over the bay of St. Andrews. The city was teeming with students with friends and family who had celebrated their graduation. 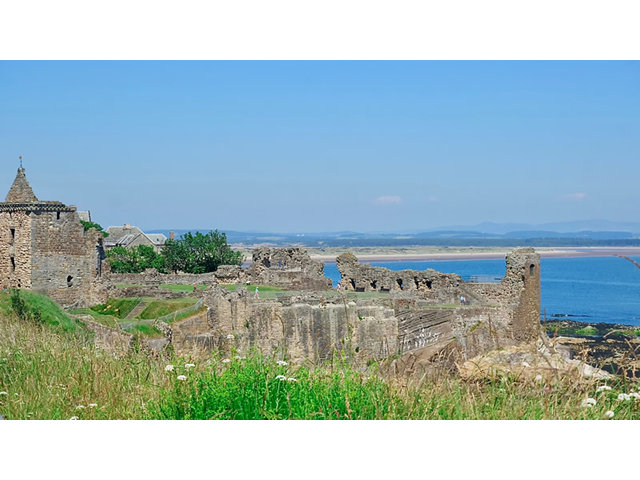 St. Andrews is famous for its university. As it was already past midday, we went for a small city stroll. Our destination was a small organic food store on South Street. There we bought delicious strawberries and a fresh baguette. We took the shortest way back to the beach. 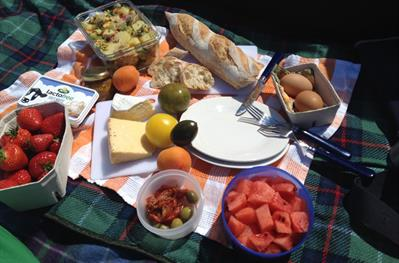 There is nothing better than sitting on a picnic blanket on soft, warm sand while savouring a delicious lunch and looking at the blue sea. The water was warm enough for children to swim. For the adults it was enough to walk with their feet through the clear water. Such days should be enjoyed more often in the year.